In tenth pAsuram, AzhwAr says that emperumAn will arrive with periya pirAttiyAr and quickly remove the obstacles mercifully. Subsequently, AzhwAr says while removing the obstacles, he will do it very quickly. Tenth pAsuram – When asked “When will emperumAn and thAyAr will eliminate the obstacles?”, AzhwAr replies that they will do it as soon as one bows at the lotus feet of emperumAn. emperumAn who has garudAzhwAr (who destroys the enemies of bhagavAn’s devotees) in his flag, who is with a beautiful form, who is the husband of srI mahAlakhsmi, will destroy the cruel karmas (puNyam/pApam accumulated since time immemorial) within a second. periyavAchchAn piLLai says while commenting on “kodiyA adu puL uyarththa vadivAr” that – the reason AzhwAr quoted garudAzhwAr here is to highlight that emperumAn considers the ones who surrenders now to be the same as nithyasUris. kadivAr thIya vinaigaL – emperumAn who has the quality of removing the cruel sins that cannot be eliminated by an individual’s self-effort even while tried perpetually. In 8th pAsuram, AzhwAr says “vazhininRa valvinai mALviththu” – once surrendered, emperumAn will remove the sins. In 9th pAsuram, AzhwAr says “irumai vinai kadivAr” – since he is with srI mAhAlakshm, he will remove the sins. When asked “How long will it take for him to remove the sins?”, AzhwAr says “in a second”. nodiyArum aLAvaikkan – the time measurement that lasts a second – indicates “immediately”. 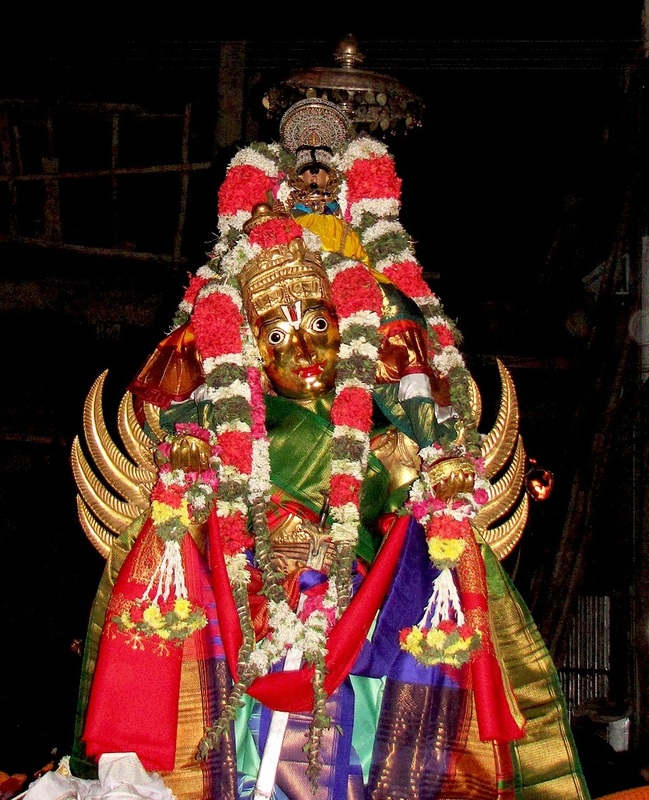 kodiyA adu puL uyarththa vadivAr – vadivu is explained as svabhAvam (nature/characteristic) and rUpam (form). Even seeing the garuda flag from the distance, one can understand the nature of emperumAn having garudAzhwAr (who destroys the enemies) as/in his flag. vadivAr also independently means “having a beautiful form”. vadivArmA – mA indicates srI mahAlakshmi. Here vadivAr is an adjective for thAyAr – the one who has complete form, beautiful form, suitable form. mAdhavanAr – Only if pirAtti is advising him by being nearby, he will remove the sins. pirAtti says “On one side, there is birth and on the other side, there is death. In between there are diseases. How can you see his (the one who surrenders) mistakes? If you have to cite the mistakes and ignore him (to suffer in this samsAram), you have to give up on every one. Forgive him” and emperumAn says “forgiven” to satisfy her. This entry was posted in thiruvAimozhi, thiruvAimozhi 1st centum on August 31, 2015 by Sarathy Thothathri. Thank you very much for the fabulous translations. Swamy, wanted to point just a small correction in the paragraph titled “Simple transalation (based on vAdhi kEsari azhagiya maNavALa jIyar‘s 12000 padi)” -> “garudAzhwAr (who destroys bhagavAn’s devotees)” —> maybe “garudAzhwAr (who destroys bhagavAn’s devotees’s enemies)” and “how is the husband of srI mahAlakhsmi” –> maybe “who is the husband of srI mahAlakhsmi”. Swamy, please check the above and check if these can be changed. dhanyOsmi swamy for spotting the error and highlighting the same. adiyen have corrected both of them now.